One of the favorite Filipino dish and even myself really like this recipe and one of the Simpleng Luto ni Nanay. There is so many ways to cooked or prepare this dish one of it is my style on how to prepare the delicious food. 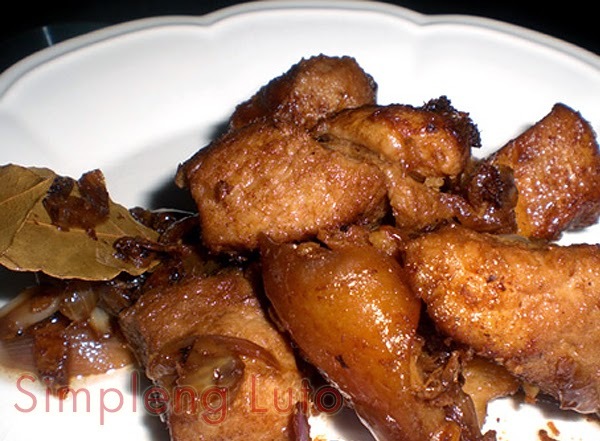 Dried adobo in oil. Saute garlic, onion in a small amount of oil together with the soften pork in a medium or small amount of fire to avoid the bitter taste of soy sauce. Add small amount of water and a teaspoon of vinegar and mix.